Lemoene jy gaan honger ly. In this rendition, metaphors & similes are a thrown in word for word to enhance the weight of the poem, and to make the situation sound more robust and more intense. The poet simply states that we need to deal with issues using words not fists, we need to sit down and resolve matters in dialogue, communication and understanding. The poem describes a setting where different elements and crayons are fused together and everybody ends up shouting, and wanting to be heard but refuses to listen to reason and only wants to settle it using fists and all the poet wants to do is speak word. In this poem the poet talks about a dream, and in this dream he asks his grandparents about the meaning of the word Afrikaans, what it signifies, and what it stands for, because he says people are calling him names and he is just a child with dreams therefore loves and appreciates everybody regardless of who they are or where they come from, and in the end he ends the poem by saying: Ek praat nie saggies ek praat met jou. (I’m not talking soft or silently I’m talking to you). He describes the dream being so soft like soap, father knocking on the front door, a girl singing and ends up saying he can’t remember he was confused and believes Afrikaans is just a language like any other and we shouldn’t criticise it or blame it because of past and history of South Africa. Skietreker ( Reitumetse Richard Segopolo Seape) is a poet, author and performer from Thabanchu in the Free State. He writes his metaphors and similes in English, Setswana, Sesotho and Afrikaans, penning about subjects relating to racism, discrimination, abuse, poverty, Aids, spirituality, love and social ills affecting the youth. He has performed on stages like Macufe annual festival (2005). In 2007 his poem titled Spiritual Struggle was published in an anthology called A Prayer Away in Durban. He is also a former member of the poetry group Infinite Motions (2008). 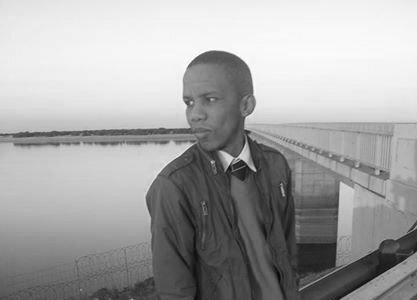 He has appeared on Frenzy (ETV), Street Journal (SABC 1) and Lentswe poetry project (SABC 2). He was also the founder of Boston Poetry Movement (2008) and the brains behind the initiative of Velocity open mic sessions at iBurst in Durban. In 2009 he was awarded a certificate of appreciation by the Bloemfontein public library in recognition of valuable contribution to literature in the Free Sate. He published his first collection of poems titled Apartheid Ek Gaan Jou Boks in 2007 and in 2012 he received assistance from the department of Sports, Arts, Culture and Recreation to republish his power packed Apartheid Ek Gaan Jou Boks vol 2. He was also a volunteer for the SA Literary Awards 2012, and he also performed & rendered a creative writing, poetry workshop for Legae Primary School at Africa Century International African Writers Conference and shared a stage with Tinah Mnumzana, Lesego Motsepe, Hector Kunene and Charmaine Mrwebi.